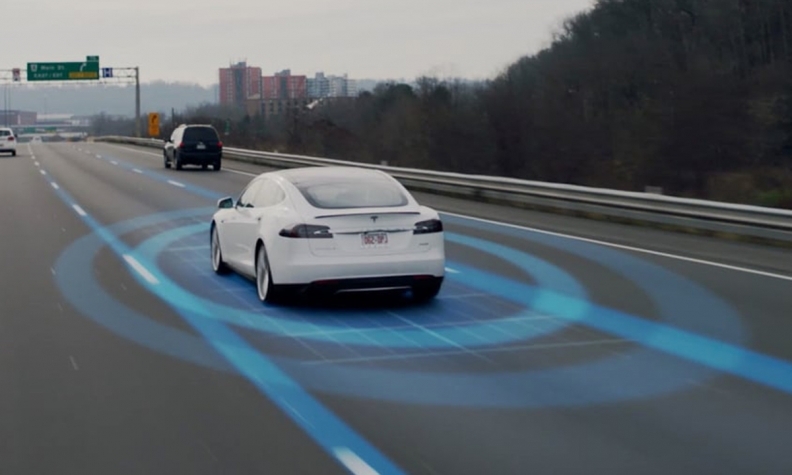 An image from Tesla's website promoting the automaker's Autopilot technology. SAN FRANCISCO -- Two U.S. consumer advocacy groups urged the Federal Trade Commission on Wednesday to investigate what they called Tesla's "deceptive and misleading" use of the name Autopilot for its assisted-driving technology. The Center for Auto Safety and Consumer Watchdog, both nonprofit groups, sent a letter to the FTC saying that consumers could be misled into thinking, based on Tesla's marketing and advertising, that Autopilot makes a Tesla vehicle self-driving. Autopilot, released in 2015, is an enhanced cruise control system that partially automates steering and braking. Tesla states in its owner's manual and in disclaimers that when the system is engaged, a driver must keep hands on the wheel at all times while using Autopilot. But in the letter, the groups said that a series of ads and press releases from Tesla as well as statements by CEO Elon Musk "mislead and deceive customers into believing that Autopilot is safer and more capable than it is known to be." "Tesla is the only automaker to market its Level 2 vehicles as 'self-driving,' and the name of its driver assistance suite of features, Autopilot, connotes full autonomy," the letter read. "The burden now falls on the FTC to investigate Tesla's unfair and deceptive practices so that consumers have accurate information, understand the limitations of Autopilot, and conduct themselves appropriately and safely," it read. Two U.S. Tesla drivers have died in crashes in which Autopilot was engaged. The most recent crash, in March, is being investigated by safety regulators. Tesla has said the use of Autopilot results in 40 percent fewer crashes, a claim NHTSA repeated in a 2017 report on the first fatality, which occurred in May 2016. Earlier this month, however, the agency said regulators had not assessed the effectiveness of the technology. Last month, another group, Consumers Union, the advocacy division of Consumer Reports, called on Tesla to improve the safety of its Autopilot system.